Which Rangemaster is right for you? In Rangemaster’s standard models, you’ll usually find a fanned main oven and conventional second oven, as well as labour-saving catalytic cook & clean oven liners, and much more. Beyond these shared features, you’ll want to weigh up the benefits and cost differences of each. 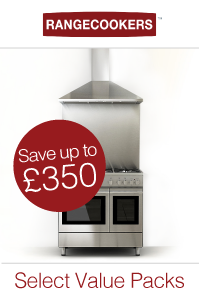 is a great option, with prices currently starting at £1425 for the 90cm model, including VAT and delivery. Also available in a 100cm width, the Kitchener has four energy options: natural gas, dual fuel, fully electric (90cm model only) and LPG gas (100cm only) plus three colourways – stainless steel, matt black and cream, all with chrome handles and knobs. And if you want a supersized Kitchener, there’s a 110cm ceramic model that will make a firm foodie statement. Whether you prefer gas burners or a ceramic hob, the Kitchener is an attractive addition to any kitchen at an affordable price, with all the essential features, perfect for family meals and entertaining without breaking the bank. , from £1575, could be for you. For a little more than the Kitchener, you get the option of an additional colourway - a sophisticated cranberry shade - and slightly sleeker styling for a contemporary edge. The glide-out grill pan is another useful upgrade for ease of use. With 90cm, 100cm and 110cm models to choose from, there’s plenty of flexibility to choose the best size for your kitchen, too. The 90FX switches two ovens for one single large oven, with a large window giving it a modern look that may be welcome for smaller, design-conscious families. 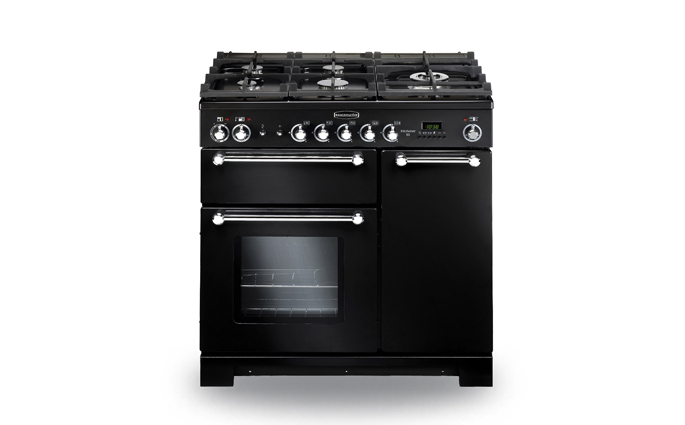 is the ideal option for a performance cooker in the standard price range bracket, starting from just over £1660. Again available in three widths, the Classic comes in cream, cranberry or black and features a decorative handrail just like a vintage range cooker, the perfect place to keep oven gloves handy or dry off a tea towel while you’re cooking. Whichever energy option you prefer – dual fuel, all electric, natural gas or LPG - there’s complete flexibility at all widths. Take a step up to Rangemaster’s deluxe models, and you’ll appreciate an enhanced specification. As well as a multifunction main oven and fanned second oven (as opposed to the standard fanned and conventional ovens), rapid response on the main oven and a glide-out grill tray, there’s often a proving drawer on 110cm models to give your bread-making the edge, as well as additional colours available in the palette. So what else is different? greater design flexibility, thanks to extra colourways of racing green, regal blue and olive, and the choice of chrome or brass handles and handrail. add-ons include a handyrack on the oven door, which simply swings out as you open it, speeding up access and making it simpler to check on, turn and take out food. An updated plinth adds to the ‘pro’ feel of this desirable model. has all the appeal of a traditional enamel-fronted range, with the ease of use and convenience of modern technology, so if you love the look of an AGA this could be the range cooker for you. It’s available in five colours – black, white, cream, cranberry and olive – with chrome handrail and spiral handles completing the vintage feel. Widths are 90cm and 110cm, with dual fuel and all-electric energy options on both. makes a stylish monochromatic statement in finishes of gloss black, matt slate, stainless steel or white, all with chrome handles. 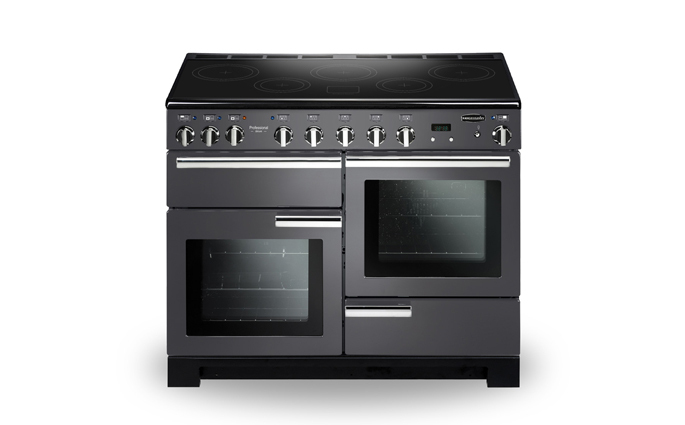 Depending on your size preference, there’s a 90cm all-electric cooker with induction hob or dual fuel model and a dual-fuel 110cm model, while the all-electric 110cm options offer the choice of a slow-cook oven (SE model) or proving drawer. Other standout features include a deep glide-out grill tray. is sure to take centre stage in any traditional kitchen, thanks to a choice of intensely vibrant colours and attention to detail with French-flavoured styling. Its solid-colour frontage comes in stainless steel, china blue, cherry red, white, gloss black, cream or slate. Options include with 90cm and 110cm dual-fuel models as well as 110cm all-electric with induction hob. Now that you’re starting to find your way around the multitude of models, why not browse the Rangemaster collection here?